Clean Lakes Alliance is excited to partner with the Friends of Lake Kegonsa Society (FOLKS) for one of our 2018 Clean Lakes Grants. FOLKS is a non-profit organization working to protect the environment and recreation of Lake Kegonsa and its surroundings. Leaf management in the Yahara River Watershed is an important step toward creating healthy lakes. By following effective leaf practices, we can reduce the amount of phosphorus reaching our waters. Phosphorus is a naturally occurring element found in leaves, dirt, manure, and other organic matter and is the root cause of water quality problems in the region. When excessive amounts enter our lakes, phosphorus can fuel toxic cyanobacteria (blue-green algae) growth which can harm people and animals. Through a Clean Lakes Grant awarded for 2018, the volunteers of FOLKS are working to encourage good leaf management practices around Lake Kegonsa. Clean Lakes Alliance has contributed $5000, which will leverage a $10,000 total project budget. In a 2017 Town of Dunn leaf vacuum pilot program, FOLKS received funding from Yahara WINS (Watershed Improvement Network), to reduce leached phosphorus in stormwater runoff by keeping leaves out of streets. After a successful pilot program, FOLKS will expand the leaf vacuuming project this fall and team up with the City of Stoughton and the Town of Dunn to help the Town of Pleasant Springs with its leaf management practices. Lake Kegonsa is located within the Town of Dunn and the Town of Pleasant Springs. Prior to 2017, the towns did not offer a leaf collection service. The goal of the 2018 project is to include all 700+ homes around Lake Kegonsa. The City of Stoughton will rent their leaf vacuum to the Town of Pleasant Springs. FOLKS will assist with funding for staff and rental fees associated with the operation and the Town of Dunn will provide expertise of the equipment. The Town of Dunn purchased their own leaf vacuum following the successful 2017 pilot program. More than 50% of the phosphorus in urban stormwater can come from leaves in the street. 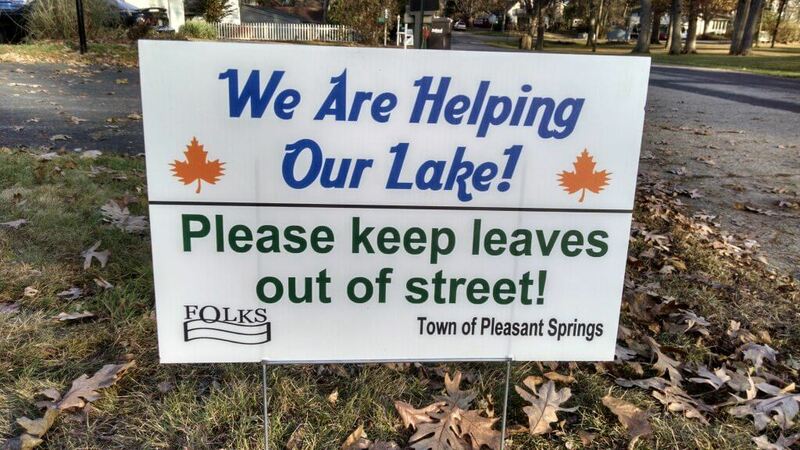 By using a leaf vacuum, the Town of Pleasant Springs and the Town of Dunn will keep an estimated 115 to 575 pounds of phosphorus out of Lake Kegonsa. One pound of phosphorus produces up to 500 pounds of algae – which means up to 287,500 pounds of algae will be kept out of the lake! FOLKS will also provide funding for educational materials, which will teach homeowners about the relationship between leaf management and clean waters. Although some homeowners are already mulching or composting leaves, many blow leaves directly into the lake, allow leaves to remain in the streets, or burn their leaves. Burning leaves can have a negative impact by concentrating phosphorus into ash that ends up in the lake. FOLKS volunteers will encourage additional positive leaf management practices around Lake Kegonsa. 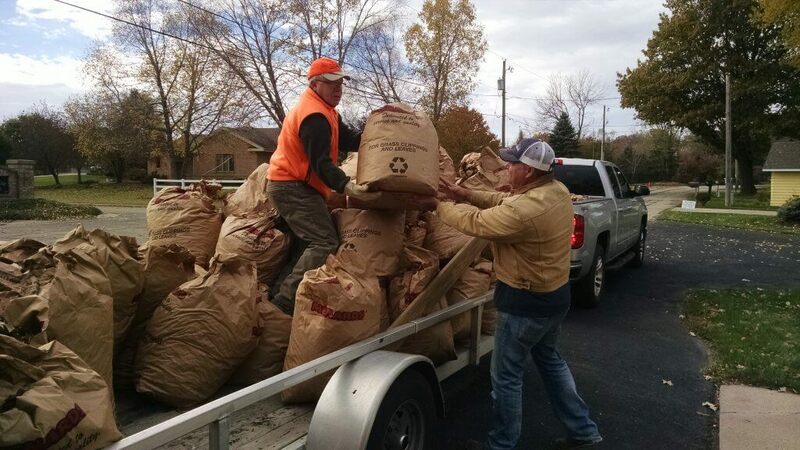 Twenty compostable bags will be available to each lake household for residents who prefer to bag and deposit leaves at town compost sites. Expanded town compost days and times will be offered through the autumn season. In addition, volunteers will help rake leaves out of the streets and teach residents about good leaf management practices. FOLKS expects this leaf management initiative will help residents develop long-term habits of properly managing leaves around Lake Kegonsa. Thank you to the Friends of Lake Kegonsa Society for bringing this important project to the Yahara River Watershed. Clean Lakes Alliance is excited to invest in this project to improve lake water quality! Karin Swanson is the Marketing and Communications Associate Manager at Clean Lakes Alliance.